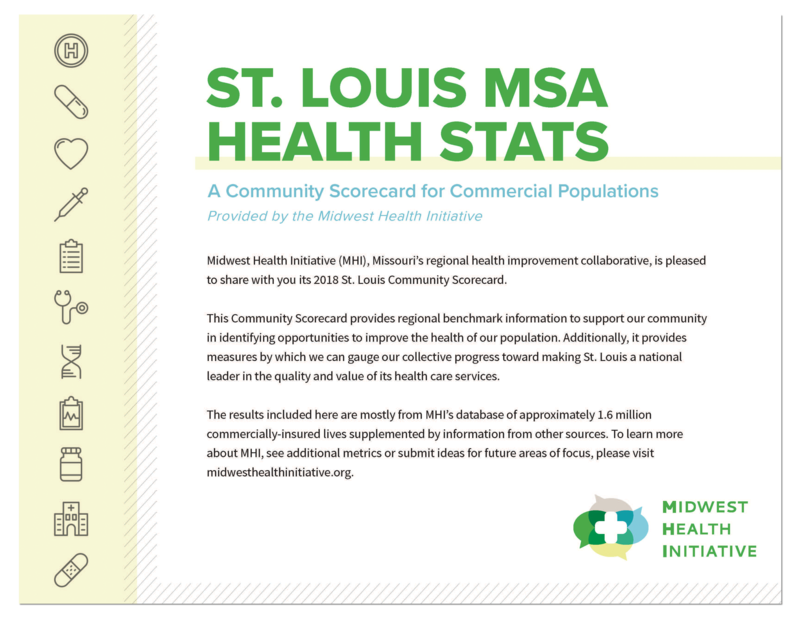 Midwest Health Initiative (MHI), Missouri’s regional health improvement collaborative, is pleased to share with you its 2018 St. Louis Community Scorecard. This Community Scorecard provides regional benchmark information to support our community in identifying opportunities to improve the health of our population. Additionally, it provides measures by which we can gauge our collective progress toward making St. Louis a national leader in the quality and value of its health care services. The results included here are mostly from MHI’s database of approximately 1.6 million commercially-insured lives supplemented by information from other sources. To learn more about MHI, see additional metrics or submit ideas for future areas of focus, please visit midwesthealthinitiative.org.